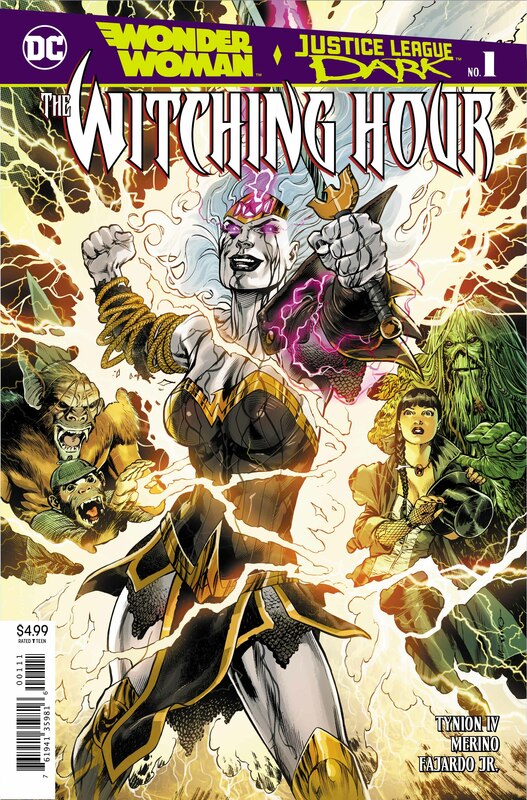 Wonder Woman and Justice League Dark: The Witching Hour #1 Review – AiPT! If one thing can be said for James Tynion IV’s writing, it’s that he sticks to his vision. That can be good or bad, of course, but if you’ve been enjoying Justice League Dark as much as I have, you’ll know I mean it positively in this case, as The Witching Hour’s first issue is a dark, somber piece that establishes the stakes for an expansive, reality shaking event unlike any DC has seen in quite some time. It certainly helps that Jesus Merino’s artistic efforts lend an appropriate darkness and weight to the whole affair, too. What’s it about? Immediately following the events of Dark #3 (and re-treading them a little too much for my taste), Tynion IV goes to quick work introducing us to the history of Hecate’s magical stranglehold on the world, and on her chosen children, including Wonder Woman, through an evocative and sharply written, transportive vignette. This is quickly followed by a portend of what’s to come — blood, viscera, ash, and fire included — as well as a smart explanation as to why the Justice League won’t be helping here, without so much as a flinch. It’s a tightly woven narrative that meets few hurdles, the largest of which being why Wonder Woman would keep her previously unknown powers a secret from her friends and shines best when Tynion IV writes from the perspective of the angry, forgotten, and honestly scary god Hecate but also works largely well elsewhere. There are still more questions than answers, of course, but they’re questions I want answers to rather than ones I feel frustrated by or ones that feel like they’re stacking up without any natural conclusion. Everything here feels concrete, connected, honed and interwoven, as if there’s more to come in the best of ways even if this issue doesn’t get there just yet aside from its explosive, gory cliffhanger. When angry witch Goddesses are afoot, when Wonder Woman’s eyes bleed black, when Swamp Thing’s rooty body reaches down through a basement full of his husks and more in one of the more boring issues of this story yet (which it undeniably is)? You can only hope Tynion IV…and Hecate herself, have more planned to up the ante in what’s to come. It’s good, then, that he’s found someone in Jesus Merino that can so wholly execute that vision. Because, although the art here is somewhat one-note, it is still stunning in its execution, its grandiosity, its darkness, and in highlighting the characters standing against that darkness. The sheer amount of attention given to the double page spreads, finer detailing (hello Swamp Thing) and dynamic layouts is staggering and more than enough to forgive the relative sameness the color and expressions have here. All said and done, this is a thrilling, tightly scripted story that could’ve been easily integrated into the main Justice League Dark story line but does just as well on its own, issues of retread aside, and I’m eager for more. While not as bombastic a follow-up as readers might have expected coming out of the stunning Justice League Dark #3, The Witching Hour’s first issue is a darkly enchanting, capable, and palpable affair that ups the ante well enough to keep us interested in what comes next. Merino's art channels both the light and dark of the world in good artistic balance, casting a long shadow across our heroes and leaving their fates in question. Tynion IV's knack for writing characters who feel unique remains intact even in the grimmest of situations to great effect. There's too much time spent re-telling the events of Justice League Dark #3. I find it hard to believe Wonder Woman wouldn't confide in the League.